[no-glossary]Heavy-duty vehicles consume 2.9 million barrels per day of petroleum fuels in the United States today. In 2011, the National Highway Traffic Safety Administration and the Environmental Protection Agency adopted standards to reduce the fuel consumption and greenhouse gas emissions of heavy-duty vehicles in model years 2014–2018. 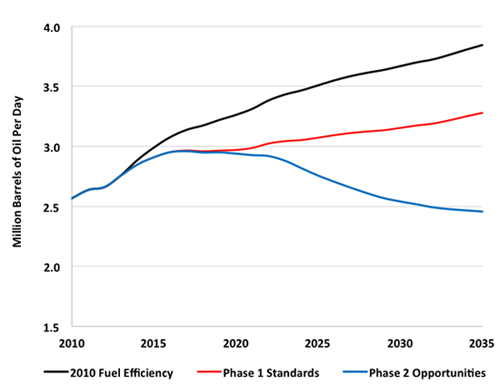 The 2011 (“Phase 1”) standards will reduce new heavy-duty vehicle fuel consumption by 15%, on average, producing savings of half a million barrels of oil per day by 2035. The agencies are now working on the next phase of the standards, which will apply to vehicles in later model years. Although a proposed rule is not expected until late 2014, now is the time to consider the basic parameters for the Phase 2 standards. ACEEE outlines our take on the opportunities in a new fact sheet, Further Fuel Efficiency Gains for Heavy-Duty Vehicles. So what should be done in Phase 2? The agencies should treat vehicles as systems, rather than as collections of components, in setting the standards. That will help spur the development of better transmissions, driveline efficiency, powertrain integration, and hybridization. Aerodynamic trailers should be integrated with tractors. The standards should draw into the market advanced technologies such as the engine ’bottoming cycle,’ which has been demonstrated in the Department of Energy’s SuperTruck program. Heavy-duty pickups should benefit from all of the applicable engine and transmission technologies used by their light-duty counterparts, and hybrids should be integral to the vocational vehicle technology package. Our analysis, which draws from a 2010 National Academy of Sciences report and the agencies’ work on the Phase 1 rule, shows that for new heavy-duty vehicles as a whole, strong Phase 2 standards could reduce fuel consumption to 26% below Phase 1 levels, which results in a 37% overall reduction from pre-Phase1 levels. Technologies contributing to this reduction generally have a payback period of 3 years or less. Standards set at this level in 2025 would yield more than 800,000 barrels of oil savings per day in 2035 beyond the benefits accrued by the Phase 1 standards, as shown in the figure below. Engineers now envision substantially greater tractor-trailer aerodynamic drag reductions than our assessment reflects, which will permit further power train optimization. In addition, the future role for hybrids and other advanced power trains is likely much higher than we assumed. So the fuel savings potential for heavy-duty vehicles does not stop with the reductions shown here.